It was not going to be a typical Saturday of lounging around the house and doing nothing – for I had planned an adventurous day trip to visit some of southern Arizona’s “must-see” attractions. I figured that a whole day would permit me enough time to visit the Mission San Xavier del Bac, the Titan Missile Museum in Sahuarita, and the Acadia Ranch museum in Oracle. As usual I was flying solo, but I didn’t let the situation get me down. Interstate 10 is the fastest route from Phoenix to Tucson, although there isn’t much to look at and it’s a boring drive. Luckily for me, traffic was light on this Saturday morning. 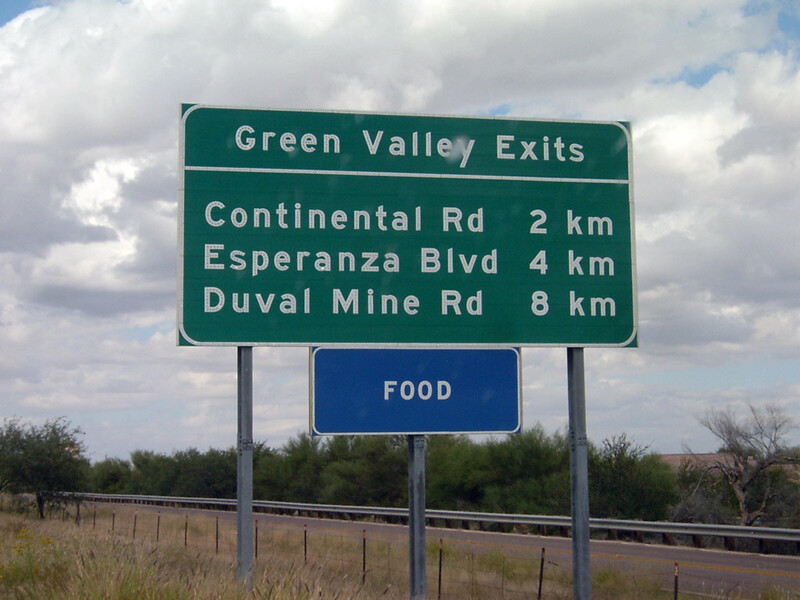 The signs on Interstate 19 in Southern Arizona are famous for their metric measurements. Right in the center of Tucson, the Interstate 10 curves and continues east to El Paso, while Interstate 19 continues south to the Mexican border at Nogales. The interesting thing about Interstate 19 is that most of the signs are Metric, which was a response to the push to “go metric” at the time the highway was constructed in the 1970s. 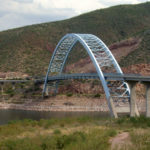 It’s also one of Arizona’s two Interstate highways that does not connect to any other state. 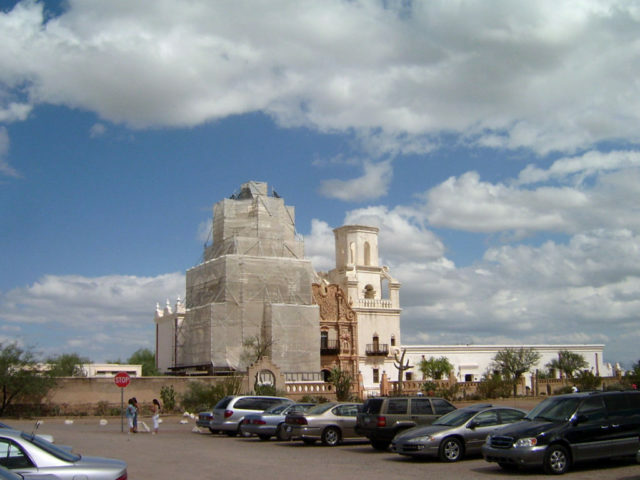 Just a few kilometers south of Tucson is the exit for San Xavier Road, where the mission is located. In fact, it’s hard to miss the bell towers reaching toward the heavens as you are barreling down the Interstate. This is one of the premier examples of Spanish Mission-style architecture that has been mimicked endlessly since its completion, no doubt due to its simplicity and its beauty. This historic Catholic mission was completed in 1797. During my visit in 2006, the west tower was covered by scaffolding as part of a restoration effort, which was completed in December 2008. As I pulled into the parking lot at about 11 AM I was shocked by the sheer size of the place. Considering that it was built between 1783 and 1797, the mission is now over two centuries old and still dwarfs all other structures in the area. Eusebio Francisco Kino, a Jesuit missionary who was also known as Father Kino, first founded it in 1699. 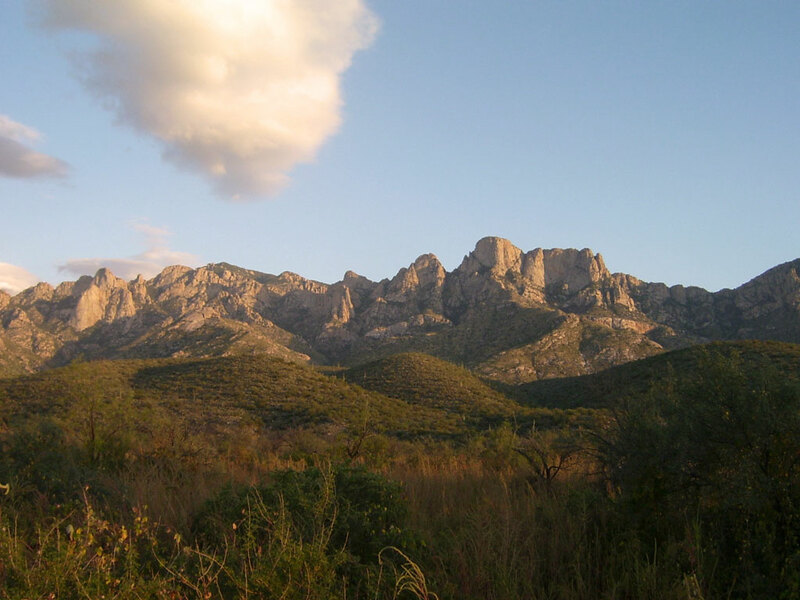 He is something of a legend in the southwest, and was known to have established over twenty missions in northern Mexico, southern Arizona, and California. Father Kino has also been called the Father of Arizona, thanks to his efforts in establishing religion and map making of the Native American lands. The beautiful whitewash of the church stands in contrast to the browns and greens of the surrounding landscape, and has earned it the nickname “The White Dove of the Desert.” It’s a fitting name for a structure as beautifully detailed and gracious as its avian namesake. 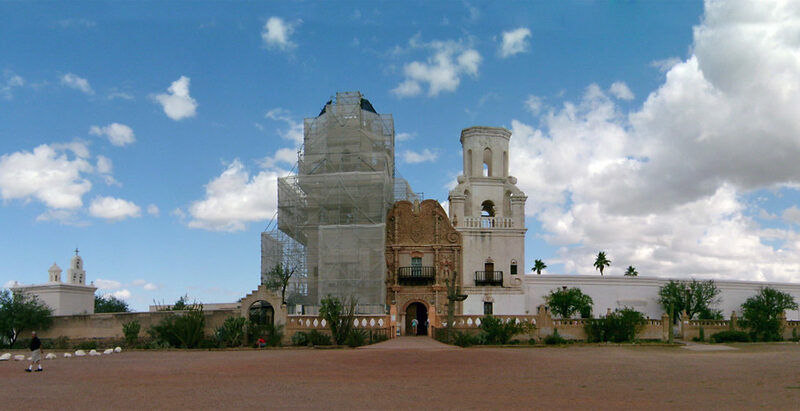 For the last few years, the west tower of the church has been surrounded by scaffolding as part of an extensive restoration effort by the Patronato of San Xavier – a nonprofit organization. The east bell tower remains unfinished, although the structure itself is officially completed. Mysteries of the unfinished tower abound, including everything from a tax-free benefit to buildings under construction at the time to the final construction of the church by the Lord himself. 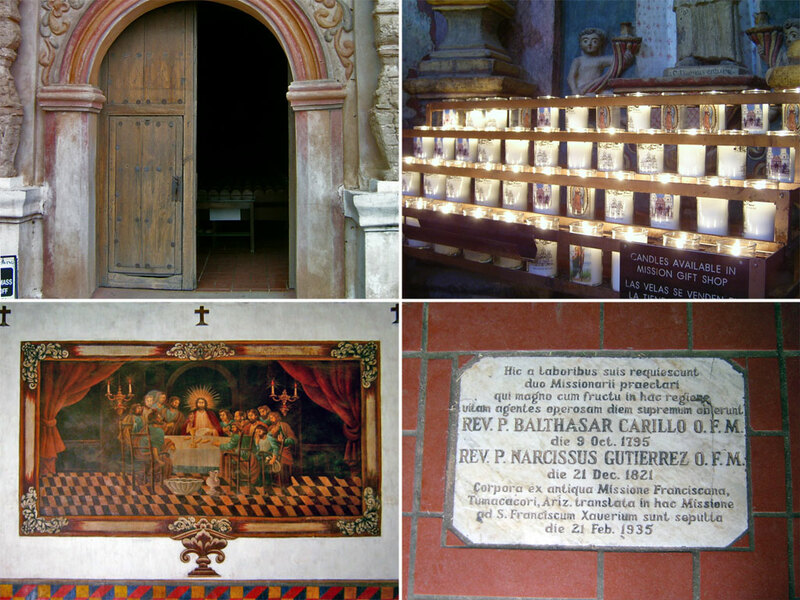 These tales add to the rich history of the mission, and to its charm. Mission San Xavier is full of ornate beauty and fine details. Just above the entrance is an intricate facade that is a prelude to the glorious ornamentation that awaits inside. Be sure to search the facade for the cat and mouse out front – legend has it that if the two should ever meet, the end of the world is near. The history continues as you pass through the giant doors carved from mesquite, a native wood of the area. A blast of cool air welcomes visitors as a pleasant surprise; how can a building constructed before air conditioning be so cool? The resourcefulness of the Franciscan builders is at work here, since the walls are made of a mud plaster that “breathes” more freely than modern stucco. Inside, the church is a cool oasis from the harsh climate of the desert. Rows of wooden pews are neatly arranged in front of the altar, which is at the top of the cross-shaped floor plan. The walls are adorned with paintings and sculptures depicting the history of Christianity, including numerous saints and holy figures. A magnificent painting of The Last Supper captures the eye, with its vivid colors beaming after the interior restoration of the 1990s. The light from dozens of candles dances around the figures on the wall as visitors move about the church in silent awe. 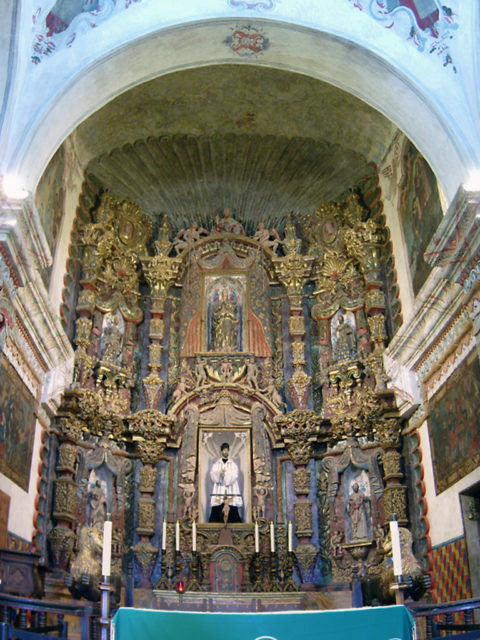 Visiting the Mission San Xavier is an experience not to be duplicated anywhere else in the Southwest. Voices are hushed and people are humbled as they make their way towards the exit. 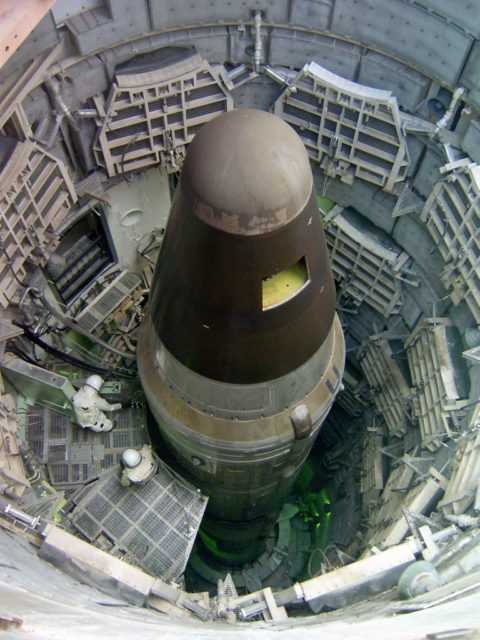 Former Titan II missile base 571-7 in Sahuarita, Arizona has been preserved and turned into a museum. 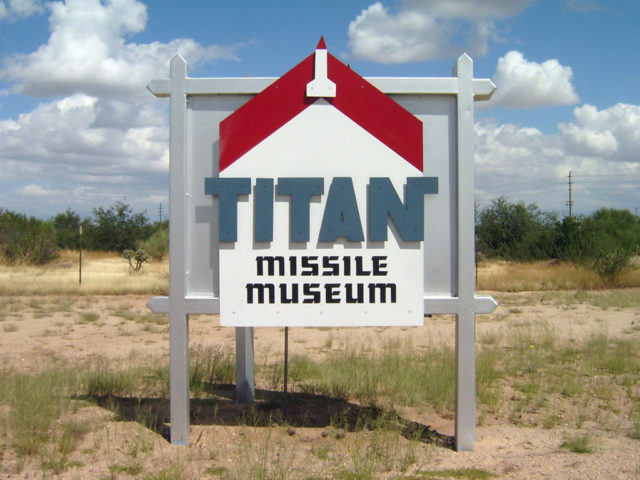 From there I continued south and followed the signs for the Titan Missile Museum. Located in Green Valley in the town of Sahuarita, the museum is not far from Interstate 19. Of the fifty-eight Titan II bases constructed in four states, this is the only fully preserved site left. All of the others were destroyed in accordance with the SALT treaty of 1979, with the last one closed by 1987. Thanks to the foresight of volunteers at the Pima Air Museum, special accommodations were made to preserve this site for future generations. This site, designated 571-7, was deactivated in 1984 and formally reopened in 1986. 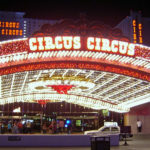 It was later recognized as a National Historic Landmark in 1994. The new visitor’s center and gift shop were opened in 2003 and are loaded with missile-themed gifts and exhibits, including a life-sized warhead on display. On the outside, surface exhibits include a Bell UH-1 “Huey” helicopter, a high-frequency radio antenna, the engines from a missile, and a viewing platform for peering down into the depths of the silo. With your hard hat on, the tour guide leads you down fifty-five steps to the first set of blast doors. The massive doors were designed to withstand all but a direct blast and weigh approximately three tons, yet they are so carefully weighted that a single person can open them. 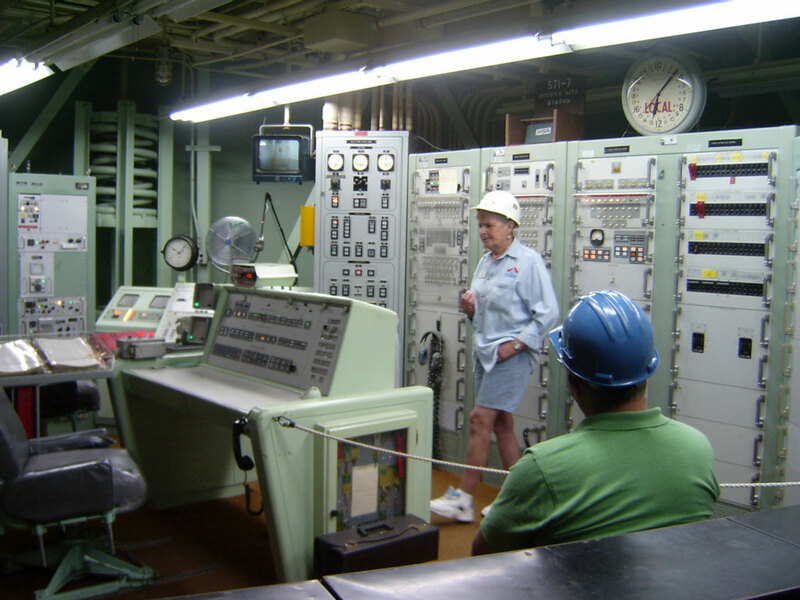 The Deputy Commander’s Console inside the Control Dome, where the missile crews worked. From there the tour group filed into the Launch Control Center where the missile crews once worked, lived, and slept. It’s a three-story structure with a dome roof that is entirely below ground. We entered the restored Control Room and crowded around the Deputy Commander’s console from which the missile could have been launched. The room is done in pale institutional green and the fluorescent lighting is not exactly warm and inviting. Racks of equipment block one entire wall of the room. Three stories of shock-absorbing springs support the structure from damage in the event of an enemy attack. It smells like old electronics and I absolutely love it! 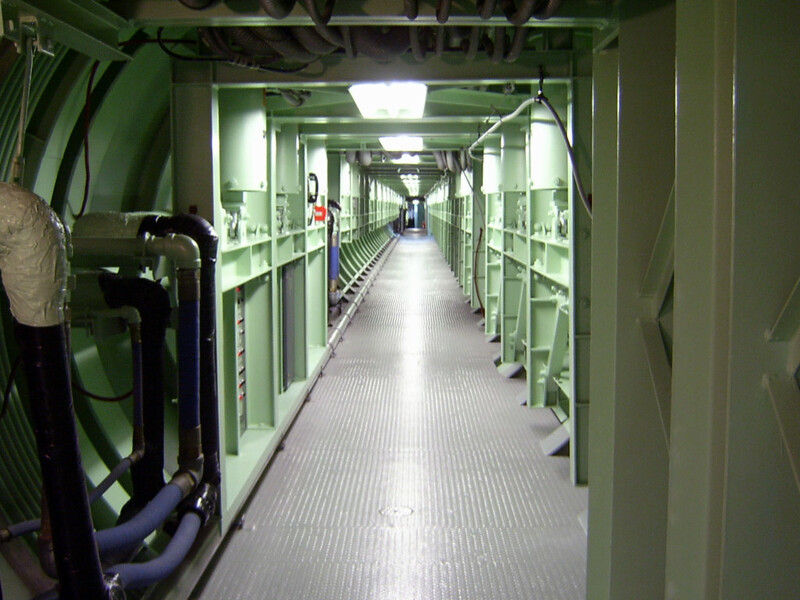 The long cableway that connects the Control Dome to the Missile Silo. Next, we walked through the 180-foot long cableway to the silo. The missile is visible through a small viewing window, as if it were some wild beast that posed a threat to tourists with cameras. The missile is actually a training missile from another facility that was brought here; the original is likely in storage at nearby Davis-Monthan Air Force Base. The hole cut in the warhead is so that foreign countries can verify the missile’s inoperable status via satellite imagery. As the tour wraps up, everyone headed above ground to the viewing platform above the silo. You’re free to poke around on the surface as long as you like, but I didn’t stay too long because I had one more stop to make. It was about 2:30pm when I left Sahuarita and headed up to Oracle, about sixty miles northeast of where I was. Taking my time, I arrived in Oracle about 4pm, and pulled up to the Acadia Ranch Museum. This grand, old house is now maintained by the Oracle Historical Society and has been the subject of much restoration. 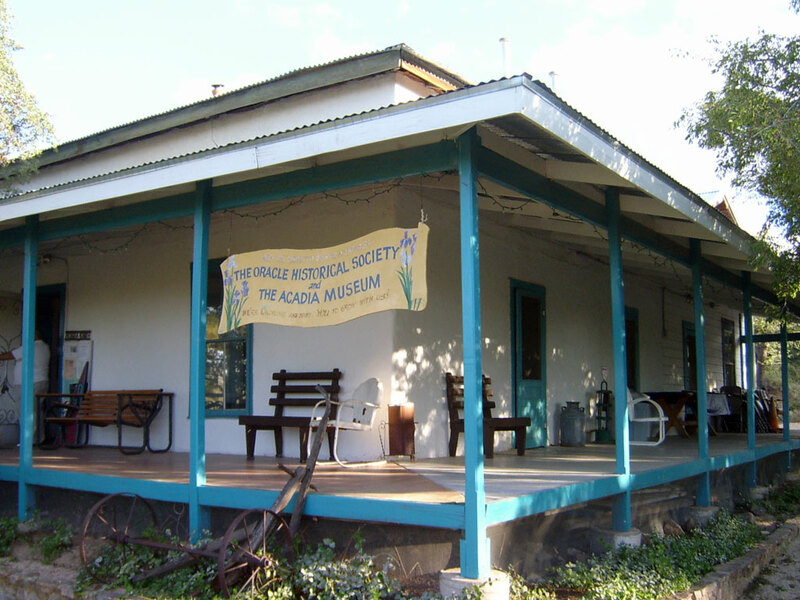 The Oracle Historical Society and The Acadia Museum in Oracle, Arizona. Originally built as a sheep ranch in the 1880’s, it has also been a post office, a morgue, and a hospital for tuberculosis patients, or “lungers.” A ghost named “George” who is thought to have once been a patient here also haunts the old place. Visitors are welcome to explore the grand ballroom, the kitchen, and the sitting rooms. A newly restored research library had just been opened up, just off the wrap-around covered porch. All kinds of interesting artifacts are there to catch the eye. Old photographs hang on the wall. A vintage AM radio sits on a tabletop. A wood-burning stove dominates the kitchen while an upright piano relaxes in the other room. Nearby, a yellowed chair sits beneath a ghastly-looking device that looks more appropriate for scaring young children than for curling women’s hair. A hand-painted sign reads “Acadia Ranch Beauty Shop,” almost a joke at its own expense. Antiques and artifacts abound at the Oracle Historical Society. The curator was a friendly fellow with a large beard, and was glad to show me a video clip of some of the Society’s recent events, including an interview with a member who had seen the ghost herself. 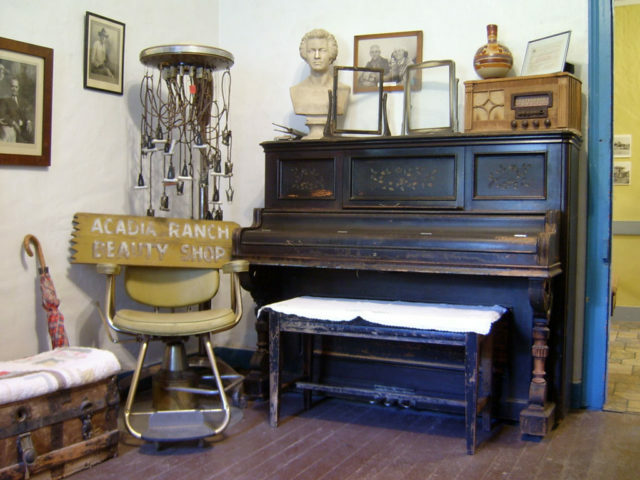 If you love history and the small-town experience, make sure to stop by the Acadia Ranch Museum. Driving past the Santa Catalina Mountains on AZ 77 between Oracle and Oro Valley. The sun began to set as I was driving home about 6pm, and it was a real treat to be passing by the Santa Catalina Mountains just then. It was a nice way to end my adventurous day as I headed back towards Phoenix via Interstate 10. In the end, I was glad I had taken the time to explore some of the Treasures of Tucson.